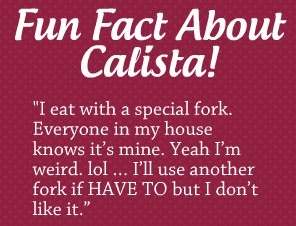 Calista Smith is a California girl who relocated to the great state of Texas. She resides there with her husband, four crazy kids and a dog. Breaking Down and Breaking Away are the first two novels in The Breaking series. She is currently working on the third in the series, Breaking Through. For a chance to win a copy of Breaking Down, visit Calista’s Facebook page, or click here to join the Reader Appreciation Author Hop. Raquel, “Rocky” as her friends call her, is an introverted girl, on the brink of turning eighteen. Having already been dealt a bad hand recently, her life gets even more complicated when her parent’s divorce forces her to relocate with her mom to the city of Rancho Cucamonga, California. She will be facing her senior year in a new high school. Fortunately Natalia, her best friend since birth, will be there. It’s the one thing keeping Rocky from completely going off the deep end. She plans to stay focused on her future, which includes trying to join the Peace Corps. Then in walks Dante. He’s cocky, handsome, well-built, popular and so not her type. She is determined to keep her distance. The last thing she needs is someone prying into her past. Dante loves a challenge though, and when his relentless pursuit captures her attention, she just can’t stop herself from falling for him. They soon realize that things aren’t always what they seem and find themselves forging an intense bond. But when life continues to hand them obstacle after obstacle, can their new found love help save her or will she finally find herself Breaking Down?